I’ve made 15 cards so far and plan to make at least 5 more. Btw, I asked on the Lasting Hearts FB page and she said envelopes are not required. This may help people who are international (like me!!) and might rather send more cards /per package due to high postage rather than fewer cards and include envelopes. I love this! Years ago, friends and I used to pick people out of the phone book and send them anonymous cards of encouragement. (Yep, out of the phone book–that’s how long ago it was!) It was such fun to imagine their expressions as they read the words that came apparently from nowhere… This challenge it going to be just as great. Count me in! Love all your cards! I am making 6 cards and donating as well. I will make some cards. I’m not sure how many. This is a wonderful thing. Your cards are gorgeous as usual!! Ifind both of these cards simple and yet so meaningful. You’re message inside so touching and very heartfelt. Thanks, I will definitely be sending handmade cards to this cause. I remember going through this and so many people just ignored our pain as no big deal. My heart hurts for those in the midst of it and I admire you, Sandy, for your generosity. I’ll be making cards and sending a donation this week. Thanks for your involvement and compassion. Mailing 7 cards and a check today. What a wonderful way to bring good out of a tragedy! I unfortunately know the pain and heartache of having a miscarriage, so I will definitely be contributing to this amazing cause! I wish there had something like this available to me at the time. I’m going to make some cards right now! I made three cards today, and will be making a donation, as well. I started making cards this weekend. Love you cards! Sandy, thanks for letting us know about this wonderful cause. I will definitely make and send cards! I’m happy to make some cards. I am committing to at least 15 cards. I’m also committting to a $25.00 donation. I will be making cards for sure thank you for the awareness and inspiration! Hi Sandy, I’m new to card making but sat down and made one that I will send in. I will donate as well. I am happy to send cards and a donation!!! You have a BIG heart Sandy!!! I have two cards already but hope to have a few more before I package them up. I am also sending a donation because I think the book idea is great. Having been so blessed to see all my children grow to adults I knew I just had to join in on this cause. I cannot begin to fathom what these mothers feel, but if these cards and books can give them a little peace and comfort I am all for it. Therefore, my ten cards and a donation are going to be sent out tomorrow. Having been through this twice many years ago, I know what something like this would mean to the recipients. I will commit to making at least one card, hopefully many more. God works in mysterious ways. Someone shared their testimony in church on Sunday about how she’d suffered two miscarriages and it has been weighing heavy on my heart. I know too many people who could benefit from something like this drive, and I’m glad I have opportunity to help someone who is going through a tragedy. I will be sending a card and donating. Thank you for your generosity and for sharing this cause. I have had to walk this road…so I think it’s a beautiful gift to give to someone. I’ve already made 7 and I’ll be posting on my blog soon (hopefully by later today!) I’m planning on making some more–but 7 are already done. I’m committing to at least 5 cards plus a check. Thanks for bringing this to my attention. I’d heard about this from a couple of other posts. I’ll be doing some cards for them. Having had friends and relatives go through this…I know that it’s a unique kind of pain and heartbreak. Anything that helps them to know that they are not alone and ease that pain just a tiny bit is very worthwhile. I never experienced this type of loss but I have had close friends who have and it’s a unique heartbreak. I have donated and will commit to five cards…have done two already. What an incredible thing Kimberly is doing. I’ve had 4 miscarriages and it’s not something everyone can understand in losing a child. I’m in tears as I read her story and WILL be mailing in cards. Thank you Kimberly for being so strong and making a positive impact on many! Thank you Sandy for spreading kindness to those who need it. I’ll make a dozen or so cards and make a donation. Cards will be created mid to late February due to rotator cuff surgery making it so that I can only use one arm. Heart wrenching….I remember the pain. Thanks for spreading the word on this important program. I will send several cards and a donation! Sandy, thank you for sharing this wonderful cause as well. I have already begun to create cards to send, 8 so far and will continue to create more as this cause is near and dear to my heart. I will also be making a donation as well. Thank you for your kindness, generosity and sharing your talent to inspire us. I am in the process of making at least four cards. My daughter suffered similar losses – the worst a stillbirth at 33 weeks. I can totally relate to the pain others go through – and grandparents too. What a great cause!!! I have had 2 friends go through this, in fact I still send one of them a card on the day her son was stillborn–just a “thinking of you today’ type thing. 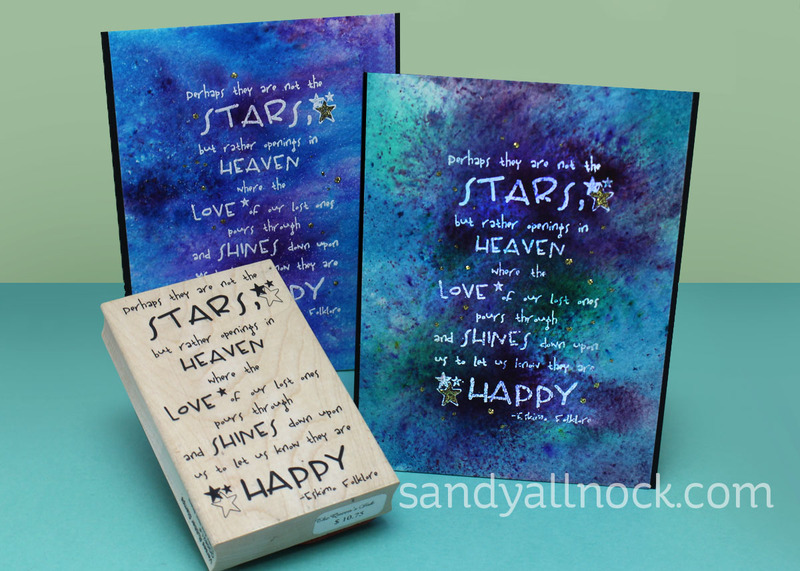 I’m glad there is no time limit–I plan to make a few of these cards to send–as I’m making cards for other occasions, I’ll just use the same papers/design and change up the greeting. 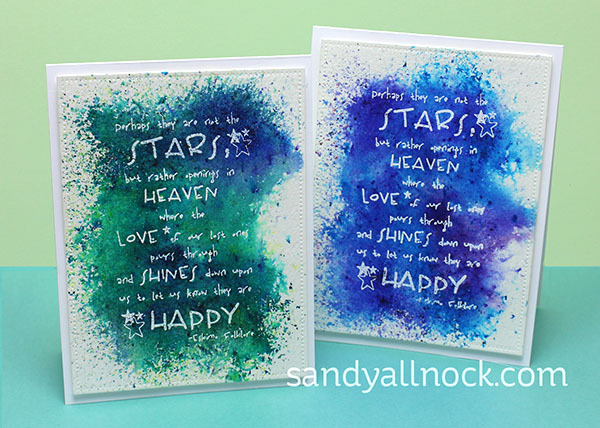 Beautiful cards, especially the ones with the “They are not stars” sentiment. Thank you for introducing me to a wonderful stamp company – they have great sentiments! What an easy way to do something meaningful for another. When I look at my kids I can’t imagine not having them. I really cannot imagine this type of pain. Thanks for letting us all know. I’ll happily help out. Going to work on some cards tonight to send in. Thank you for supporting this cause! I plan to make at least 10 cards. 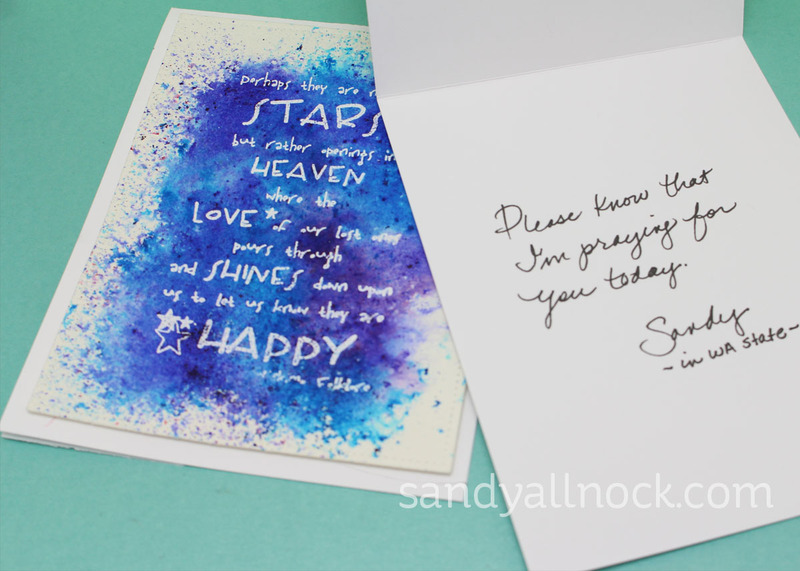 Sandy – I love following you, not just for your art and cheerful posts, but the special heart God has given you. Thank you for encouraging us to support this project. I will send a few cards plus a check this week. Working on some cards right now! This is such a beautiful way to help. I will be donating cards and $1 for each card I send. So glad you are involved in and sponsoring this worthy cause. I first saw this on Jennifer MaGuire’s site and committed to send cards there. 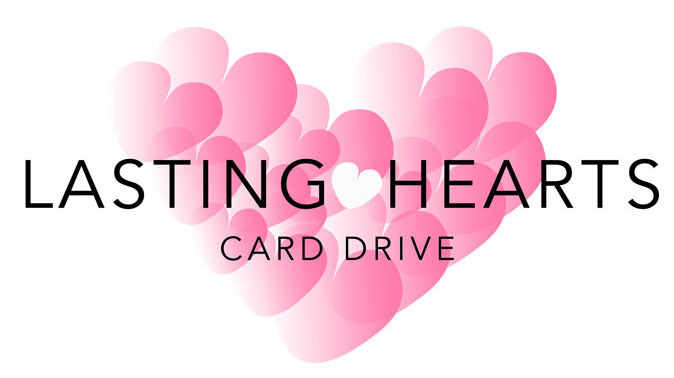 I am now also committing to send additional cards for your card drive as well. I will also be donating money per card for the purchase of books. Thank you so much for sharing this with all your followers! I have already sent in 16 cards and will do some more in the future. Also made a donation – as this is very special to me. My brother in law and his wife lost a set of twins many years ago. unfortunately as happens many times, the heartbreak split them apart. I wish pregnancy was an easy journey for everyone. Thank you, Sandy, for spreading the word about this important ministry. 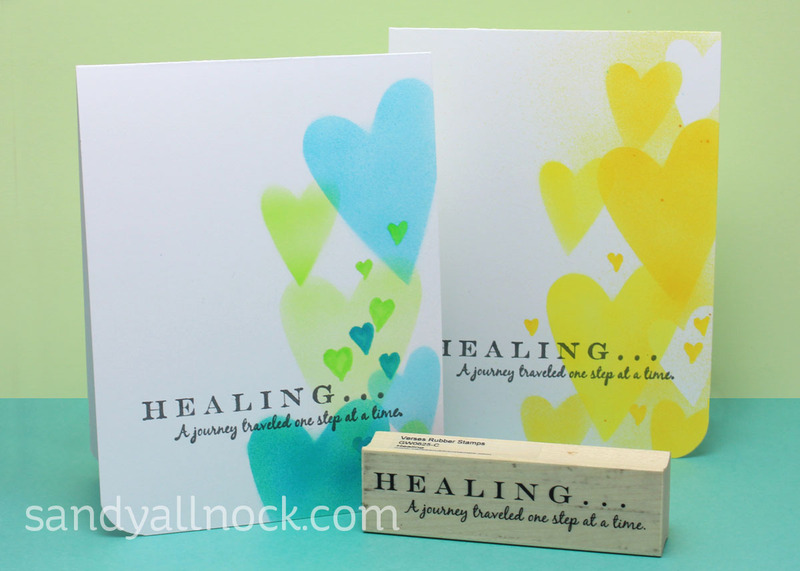 Last week, I read about Lasting Hearts over on Jennifer McGuire’s blog and have been working on cards to send in. This is a wonderful post full of caring words, thoughts, and deeds. Thank you for sharing. I missed your scope but will watch the replay today. If I weren’t traveling right now, I’d be all over this with cards. For now I will make a donation to help with the expense of the books, and cards will come later. You are an inspiration in art and in life. Thank you. Thanks for promoting and supporting this cause Sandy. What a great idea. Your generosity never ceases to amaze me. Not sure if I can get a card in this week…..been having to many sympathy cards to make, not my favorite. What a kind and thoughful cause to support. I can only imagine the heartbreak of of losing a child. My daughter’s close friend lost her young son three years ago and now her 3 year old dauughter is battling cancer. My heart breaks for these folks. 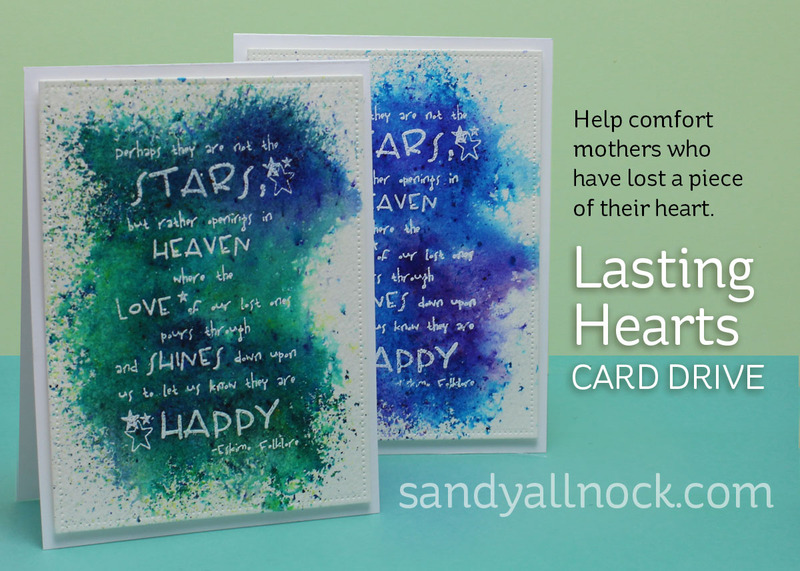 I will be sending a card for Lasting Hearts.